Nifty opened positive, and traded within a narrow range till Dec IIP data was released, which came a cropper at -0.6%. The index nosedived below 5900, but the responsive buyers from thereon took control to move Nifty into positive territory and closed the day at 5922.50, a small but significant gain of 24.65 points. The broader market though was weak, with just 555 advances to 931 declines. The 5900PE writers are back. Call option 5800 added 0.46 lacs small amount of OI with small profit booking seen at 6000 and above strike prices. Put Option 5900 and 5700 added 12.51 lacs huge amount of OI with huge profit booking seen at 5600 and below strike prices. Highest accumulation on Call option 6100 at 74.02 lacs & 6200 at 68.39 lacs whereas Put option 5900 at 72.35 lacs & 5800 at 64.96 lacs. 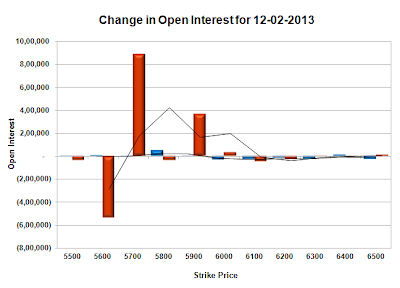 Nifty Open Interest is at 1,33,40,600 up by 2,26,350 with increase in price, most probably long build-up. 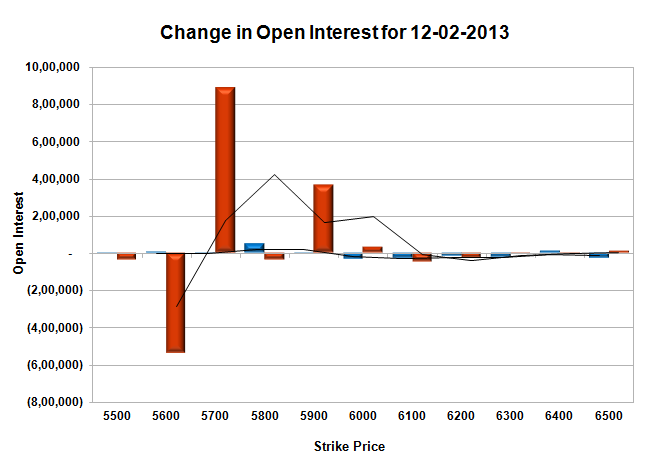 Bank Nifty Open Interest is at 12,10,000, down by 42,825, with increase in price, most probably short covering. FII’s sold huge 3.96 lacs of Futures, most probably short build-up, as their net OI increased by 3115 contract and the average price per contract comes to around 5974. FII’s future open contract as on date is 283048. PCR Open Interest (Volume) has nudged up to 1.069 due to huge addition at 5700PE level. Support at 5900PE got better with huge addition for the day and now OI now above 72.4 lacs and below that at 5800 with OI of 65 lacs. 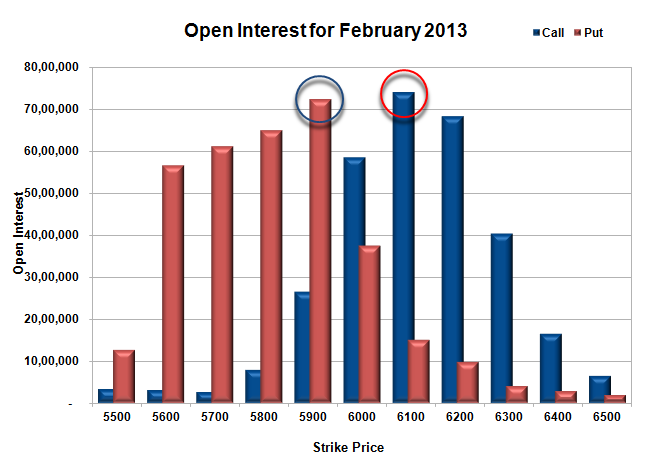 Resistance still very much at 6000CE, with OI above 58.6 lacs and above that at 6100 with highest OI of 74 lacs. 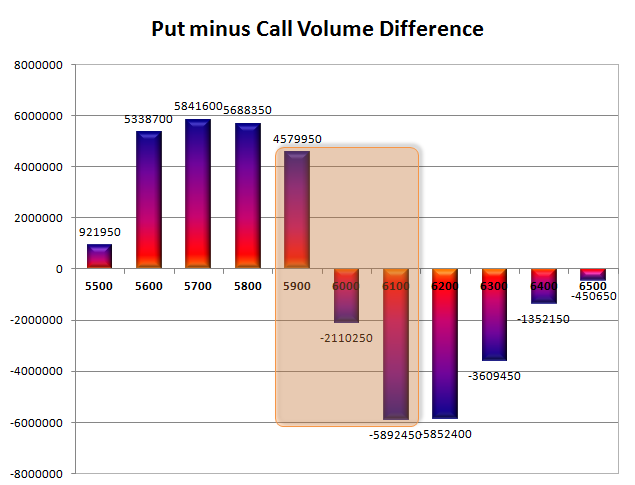 Range as per Option Table is 5876 - 5954 and as per VIX is 5875 - 5970 with 5920 as the Pivot.